the first grade hotel with conveniece of shopping and sightseeing! 2016.12.19 : 상호명이 [해운대리베라호텔]→[리베로호텔]로 변경 되었습니다. 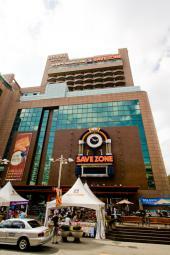 Haeundae Riviera Hotel is a five-star accommodation located on floors 9 to 16 of a large discount store, Save Zone. Among luxury hotels in array, it offers reasonal prices and warm, attentive service to satisfy guests. There is no need to wrestle with heavy shopping bags since shopping is truly convenient with the discount store directly connected to the hotel guestrooms. Excellent service including room cleaning add delight. All guestrooms, except the 16th floor, have balconies for guests to enjoy the view and the light pink wallpapers and the white and blue bed sheets create a sense of fresh ambience. Room service offers breakfast with complimentary morning coffee served to guests who are awake between 8:00-9:30 am. A complimentary tourist service is also available between 10:00-12:30 every Monday. The tour includes far-off tourist attractions like Yonggung Temple and Songjeong beach. Applications are taken at the front desk and the tour is available for 5 to 10 member groups. With Haeundae station within 3 minutes walking distance, it is easy to reach downtown areas by subway and there is a S fun Z building next to the station for a fun entertaining experience. ※ 13Jul~25Jul / 26Jul~31Aug : Name change is NOT allowed during the period.